This book is the first of its kind published on the various pertinent aspects of the Tangkhul Nagas and contributed by the native scholars. 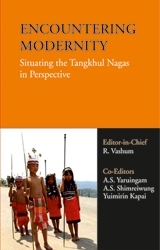 The book essentially engages on four broad areas: the engagement on the articulation of the discourses of tradition, modernity and emerging issues and trends; the inclusiveness of the various inter-disciplinary aspects and perspectives on the Tangkhul Nagas; the elements of critical analysis of the conventional tradition and knowledge of/on the community; and the attempt to open up discourses on the various aspects of the Tangkhul society. This book will be of interest to scholars of social sciences, humanities and natural sciences (including general readers) to understand the Tangkhul society in a holistic way. R. Vashum teaches in the Faculty of Sociology, School of Social Sciences, Indira Gandhi National Open University, New Delhi. A.S. Yaruingam teaches in the Department of African Studies, University of Delhi, Delhi. Yuimirin Kapai teaches in Rajdhani College, University of Delhi, Delhi. A.S. Shimreiwung teaches in the Department of Sociology, Tezpur University, Napaam, Sonitpur, Assam.